We often forget that the Crowleys had other relatives living in the Thunder Butte area. There was Joseph Shockley, who was my grandmother's younger brother by six years and lived in the area for many years. Also, there was James Shockley, another younger brother who was just a few years younger than my grandmother. James is someone I've never known much about. In fact, as a child, I never heard my grandmother mention a brother besides Joseph, although she apparently had three brothers. During much of the time that the Crowleys lives near Thunder Butte, my grandmother's brother James also lived with his wife and children in the vicinity of Coal Springs, which was just a few miles away. We did a brief post on James Shockley and his family a year ago, which can be found here. 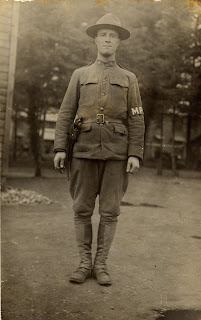 It's always interesting to find old pictures of long-lost relatives, and we've unearthed another picture of James from his days serving as a military policeman in World War I. James was born in 1892, so he would have been about 25 or 26 years old in this picture. In the late summer, all hands turned out for 'Haying Season'. Sometimes only my Dad did the haying, cutting grass with a large sickle mower pulled behind a team of horses. Following the mowing, someone would come along with a hay rake pulled by a team of horses and pile the hay into drifts. When the hay had been raked and winnowed in the field for a couple of weeks, it would be hauled in with a hay wagon and stacked in great tall stacks near the ranch. Enter the rabbits: During the dead of winter when the snow piled high over the grass, rabbits would come in great droves during the night and eat at the bottom of the hay stacks. After a while, if they ate long enough, the stack would become top heavy and fall over, and the rabbits would continue eating until they had eaten tons of hay. Enter the shooters: If we were lucky, the moon would come into the full phase when the rabbit hordes were overrunning the hay stacks. We would lay in the top of the haystacks during this moon phase, with our .22 rifles and shoot rabbits as they approached the stack. On a good night, a bad one for the rabbits, we would shoot hundreds upon hundreds of rabbits. They were of a single purpose, all they seemed aware of was the food at the hay stack, so it was quite easy to keep shooting until we had eliminated an entire wave of rabbits. No one seemed to think of this rabbit shooting as fun, it was self preservation. If we didn't save the hay, the animals would starve, and if the animals starved, so would we. Another facet of this venture was the selling of the rabbit carcasses. When we had finished shooting, the rabbit bodies would freeze rapidly. Then we would pile the bodies in a huge stack where they would remain frozen until someone could ride into Faith and notify the 'hide and fur' people who would eventually come by with a huge truck and cart off the rabbit bodies. The hides would be turned into fur coats and the meat would be turned into pet food. I do not recall anyone ever laying around during those times. Couch potatoes had not developed yet—maybe because their were very few couches. We only had chairs, and pretty uncomfortable ones at that. It was easier to sit on a horse than to sit in the house. Much of the focus of ThunderButte.com has been stories from my family, especially my father, about the kind of life the Crowley's lived at and around Thunder Butte from the time my grandfather's homestead was established about 1913 until the family moved off the land sometime after 1940. The stories are so interesting to me because of how different the land, the time, and the place was from where, when, and how I grew up. There are still more stories to tell. As the blog progresses to its third year, I've held some tales in reserve, and I continually pester my father for others – always fearing in the back of my mind that one day in the not too distant future there will not be much more to tell, at least from the Crowley family perspective. (1) Send me an email with your story to thunderbutte@gmail.com, or simply Click Here. (3) Alternatively, and this really is an experiment, you can telephone your story to me by leaving a message at (605) 593-4530 in Rapid City. I have a message length of 2-minutes, so if you need more time for your story, just call back. Of course, I reserve the right not to publish anything that I consider to be in poor taste, offensive, or disrespectful or hurtful to others. Also, I may edit your story to keep it to a reasonable length. But, if you have a story to tell that may interest others, I'll post it here with your name. Send us your stories!